The Boulevard Estate and Environs precinct is significant. The precinct comprises 1447-1495 Burke Road; 1501-1531 Old Burke Road; 1-11, 35-69 and 2-66 Munro Street; 185-215 Kilby Road; 1-7 and 2-8 Walbundry Drive; 1-7 and 2-8 Inverness Drive; 1-7 and 2-8 Riverside Drive; 1-7 and 2-8 Cascade Drive; and 1-7 and 2-8 Kyora Drive, Kew East. The precinct consists of three subdivisions: the Boulevard Estate (surveyed c.1920, not developed until 1930s); land on the west side of Munro Street (available after 1936); and land fronting Old Burke Road (subdivided 1936). 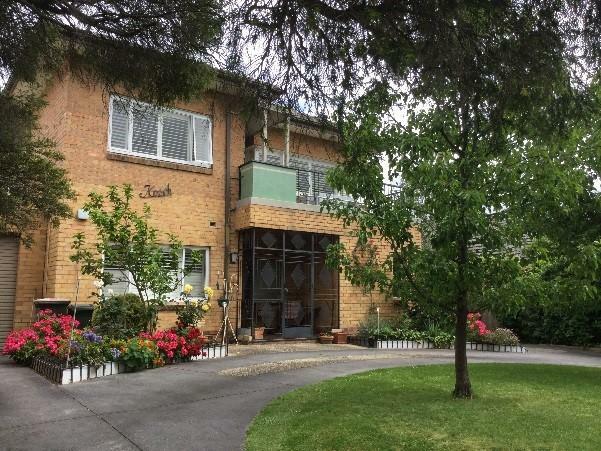 The precinct includes a range of large and smaller family homes built in the 1930s, 1940s and 1950s in a mix of interwar, late interwar and early postwar architectural styles. The character of the precinct derives from the predominance of late interwar and early postwar Old English revival and Moderne architectural and garden styles and their vernacular variants, punctuated by house designs influenced by International Modernism and its regional expression. Individually significant, Contributory and Non-contributory places are listed in the Precinct Gradings Schedule below. Original and early front fences at 185, 187-198, 191, 209, 213 Kilby Road, 1449, 1471, 1475, 1483, 1498, 1491 Burke Road, 1507, 1511, 1515, 1517, 1529, 1531 Old Burke Road, 4, 8, 10, 12, 14, 16, 18, 22, 36, 44, 46, 50, 54, 62, 66 Munro Street (east side), 7, 9, 35, 37, 47, 49, 51, 53, 55, 65, 69 Munro Street (west side), 5 and 7 Walbundry Drive, 3, 5 and 7 Inverness Drive, 3 Riverside Drive, 5 Cascade Drive, and 1, 3 and 5 Kyora Drive are significant. Original and early garages at 1449,1463, 1465, 1467, 1485, 1487 Burke Road, 1511 and 1529 Old Burke Road, 7, 9, 35, 53, 55 Munro Street (west side), 4, 12, 16, 18, 54 Munro Street (east side), 5 and 7 Walbundry Drive, 1 and 5 Inverness Drive, 3 and 4 Riverside Drive, 5 Cascade Drive, and 1 Kyora Drive are significant. The row of three mature Bhutan Cypress (Cupressus torulosa) at 1489 Burke Road and the Camphor Laurel (Cinnamomum camphora) at 61 Munro Street are significant. The largely intact front gardens at 209 Kilby Road, 1467, 1471, 1475 and 1491 Burke Road, 49 and 51 Munro Street (west side) and 36, 46 and 50 Munro Street (east side) make an important contribution to the significance of the precinct. The front garden at 56 Munro Street is sympathetic to style of house and also makes a positive contribution to the significance of the precinct. Mature ornamental trees and shrubs in front gardens throughout the precinct also contribute to the significance of the precinct. These include Crepe Myrtle and conifer specimen tree plantings, boundary plantings of roses in colourful varieties, and low shrub plantings in combinations of mixed foliage colours and textures. Non-original alterations and additions to the houses and their gardens are not significant. Carports at 11 and 51 Munro, 3 Walbundry, 2 and 6 Cascade, 6 and 8 Kyora, and 1511 Old Burke Road are not significant. 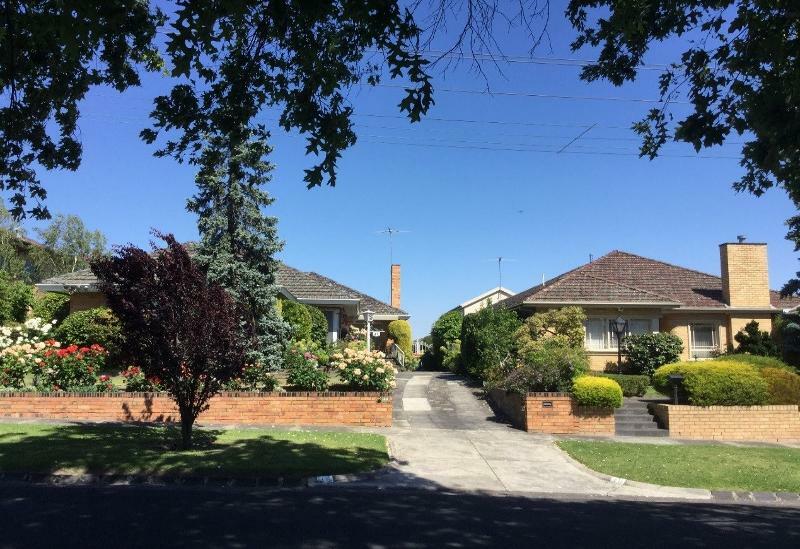 The Boulevard Estate and Environs Precinct is of local historical and aesthetic significance to the City of Boroondara. For a full list of the individual gradings within the precinct, please refer to the attached PDF citation, or the child records. The interwar and early postwar residential precinct at Burke Road (part), Old Burke Road (part), Munro Street (part), Kilby Road (part), Walbundry Drive, Inverness Drive, Riverside Drive, Cascade Drive, and Kyora Drive, Kew East, comprises mostly houses and some flats built over a threedecade period, from c.1930 to 1961. Although Boulevard Estate was surveyed for subdivision in 1920, construction did not commence until the 1930s. The houses are a mix of large, double-storey and smaller single-storey dwellings, in a range of domestic architectural styles typical of the interwar, later interwar, and early postwar periods. Stylistically, the houses and their garden settings represent a mix of tastes, from conventional to those that challenged convention. They also represent wider influences of the period in which they were built which saw a transition from austerity - the result of wartime restrictions and materials shortages - to greater prosperity, and the influence of postwar migration and international modernism on the expansion of Australia's suburban domestic architectural vocabulary. The streetscapes of the different streets in the precinct vary in character as a result of the different street tree plantings. All have lawn nature strips with pedestrian paths, and most streets retain bluestone kerbs and guttering; including extensive bluestone paving at the intersections of Munro Street and Inverness and Riverside drives. Munro Street and Kilby Road only have a densely treed character from the presence of mature larger tree species; including mature Pin Oaks on Munro Street, and Brush Box and Melaleuca on the north side of Kilby Road complemented by the median planting of large deciduous trees along Kilby Road. Burke Road is planted with a mix of Brush Box and Melaleuca trees. The five 'drives' are more open in character, lightly treed, with lawn nature strips, more recent plantings of smaller tree species, some interspersed with individual larger tree specimens. The south side of Old Burke Road is lightly treed, complemented by a median planting of mature Brush Box and Melaleuca trees, the same species mix as on the nature strips of Kilby and Burke roads (noted above). The earliest houses built in the precinct were built in c.1930-36 and display features characteristic of the brick California Bungalow, including walls that feature contrasting materials and textures, such as red brick and painted smooth and rough render, and open eaves with exposed rafter ends, tall chimneys. Only a small proportion of the houses in the precinct are built in this style, including 1461 Burke Road (view from street was obscured by vegetation) and 22 Munro Street (overpainted and window openings altered). Although built later, in c.1938-42, 197 Kilby Road is also built in the California Bungalow style (upper storey addition). Large houses predominate along the Burke Road section of the precinct, echoing the pattern of development on the opposite side of Burke Road in the HO231 Riverside Estate and Environs Precinct. These large houses are representative of variety of architectural styles, but most prominent are the interwar Old English revival and Moderne styles. The interwar Old English revival style is seen in different expressions widely throughout the precinct, with each house clearly exhibiting, through different features and different combinations of features, typical exterior characteristics of the style, including asymmetrical massing, streetfacing gables, imitation half-timbering (1449 Burke, 35 Munro and 205 Kilby for example), contrasting brick and render walls (7 Inverness), textured clinker bricks, corbelled brickwork, arched openings, leadlight glazing, tall chimneys, and catslide roofs (1 Munro, 6 Riverside, 7 Inverness). Fine and largely intact examples of the style are at 1449, 1451 and 1457 Burke Road, 6, 63 and 65 Munro Street, and 7 Inverness Drive. A fine postwar example of the style is at 1453 Burke Road. Other examples of the Old English revival style in the precinct include 1463, 1465 and 1489 Burke Road, 1, 2, 3 (flats), 4, 8 (altered), 10, 16, 35, 44 and 55 Munro Street, 191, 199, 205 and 211 (substantially altered) Kilby Road, 5 and 7 Cascade Drive, 3 Inverness Drive, 6 and 7 Walbundry Drive, and 6 Riverside Drive (overpainted). A small number of houses in the precinct, built 1938-42, and 1947, are built in the interwar Mediterranean style. These are 209 Kilby Road (built 1935-38) and 185 Kilby Road (built c.193842), Kyora Drive. The Mediterranean influence is signalled by the use of rounded arch openings (185 Kilby), window shutters (6 Kyora), wrought iron detailing (209 Kilby), and medium to lowpitched roofs with glazed multi-coloured terracotta tiles. Postwar examples of the style are at 6 Kyora Drive (built 1947, windows altered) and 1525 Old Burke Road (built 1954, altered). 1483 Burke Road is representative of a transition between the interwar Mediterranean and the postwar American Colonial styles, the latter exemplified by the bay window and small-paned window approximating Georgian proportions. Unlike the Bungalow, Old English revival and Mediterranean styles noted above, other owners and designers of houses throughout the precinct were bolder in embracing new ideas, including the pared back and streamlined aesthetic of the interwar Moderne style, and vernacular expressions of this style built by owner- or builder-designers, as well as the geometric severity and horizontality of the International style and regional expressions of Modernism. Characteristic features of the interwar Moderne style are streamlined curves, porthole windows, and strong expression of horizontality, sometimes a prominent broad-based brick chimney, some with 'skyscraper Moderne' profiles (like at 9 and 61 Munro) or 'waterfall' profiles (1515 Old Burke Road). The interwar Moderne style is seen in differing intensities in both larger and smaller houses within the precinct, including at 1455, 1467, 1469, 1487, 1471 and 1491 Burke Road, 1 and 5 Inverness Drive, 187-189 (flats) Kilby Road, 6, 7 (flats), 9, 11 (flats), 14 (altered), 18, 24, 37, 47, and 50 Munro Street, and 1529 Old Burke Road. Fine and largely intact examples of the style are at 1467, 1471 and 1491 Burke Road, and 1511 and 1517 Old Burke Road. Vernacular expressions of this style are strongly represented in this grouping. Postwar vernacular interpretations of the Moderne style are at 1475 and 1493 Burke Road, 3, 4 and 6 (windows replaced) Cascade Drive, 215 Kilby Road, 3, 5 (unsympathetic front addition) and 8 Kyora Drive, 26 (altered), 28, 42, 46, 49, 51, 52, 53, 54, 64, and 66 Munro Street, 1505 Old Burke Road (built 1961), and possibly also at 1511, 1515, 1517 and 1531 Old Burke Road (dates not able to be confirmed at these properties). The precinct contains four face brick, two-storey walk-up flat buildings on Munro Street (3, 7 and 11) and Kilby Road (187-189); 3 and 7 Munro were built 1939, the others were built in 1938-42. All are constructed of red brick, some with contrasting render and/or brick detailing, with terracotta tile hip roofs and timber sash and plate glass windows. They are all asymmetrical in design, yet reference different late interwar architectural styles, including the Old English revival architectural style, evident in the clinker brickwork, four-centred arches, and catslide roof to the entry (1 Munro), and Moderne, evident in the horizontality (187-189 Kilby, 7 and 11 Munro) and streamlined curves of the balcony (at 7 Munro). As well as the more conservative revival architectural styles, the precinct features architectural styles that were influenced by the International style, namely at 36 and 62 Munro Street, both approved for construction in 1951 but built by different builders. Characteristic features of the International style at 36 and 62 Munro Street are their geometric severity and cubiform overall shapes, plain smooth wall surfaces, expression of sharpness and precision through the black steel framed window frames against blond brick walls and, at 36 Munro, the non-rectangular shape of the rounded projecting bay in contrast to the predominantly rectangular forms. Both are corner properties which enhances appreciation of their geometric forms. 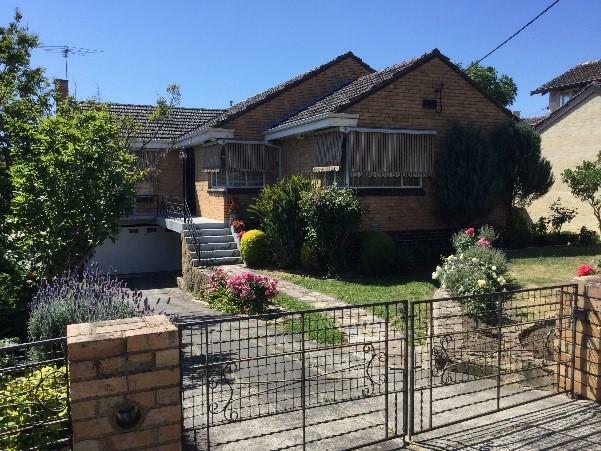 Regional expressions of Modernism are also found in the precinct, in the early postwar houses at 1481 Burke Road (aka 9 Cascade) approved 1946 (altered 1963, rear), 56 Munro, approved 195051 (altered 1955), 8 Cascade, approved 1955 (altered 1983). Three of the houses feature local stone; foundation walls at 1481 Burke Road and the chimneys expressed as a simple block at 56 Munro and 8 Cascade, which are typical of the style. The simplicity and lightness of their appearance is also broadly characteristic of postwar regional expressions of Modernism. Front fences, garages, and front gardens Many of the properties in the precinct retain their early or original brick front fences, gate piers, and gates. There is a great variety to their designs, as was typical of the interwar and early postwar periods, but there is also consistency provided by the following features that is also characteristic of the interwar and early postwar periods: front fences are generally low; entries for pedestrians and vehicles are separate, with separate gates provided for each entry; they are mostly constructed of brick although stonework veneer was also popular, or brick with 'wrought iron' (mild steel) panels incorporated; the brick and stonework front fences often feature details or materials that match the house; 'wrought iron' panels incorporated in the fences often match the gates, and sometimes balustrading on the porch or used elsewhere on the house (Cuffley,148-149). Front fence and gates at 37 Munro street, exemplify the use of materials and detailing (brickwork and detailing of the mild steel gate) designed to match the house. 50 Munro Street, brickwork and wrought iron detailing on driveway and pedestrian gates match the brickwork and wrought iron detailing of the house. Another example of front fences and gates designed to match the house at 47 Munro Street; the bricks and wrought iron insert on front fence matches the brick walls of the house and the wrought iron screens and balcony balustrade. Many of the properties in the precinct retain early or original garages. Garages became more commonplace in late interwar and early postwar residential development, reflecting the rise in car ownership at this time, and it distinguishes the later suburban development of the Boulevard Estate Precinct from those developed in the Victorian, Edwardian/Federation or early interwar periods. Mostly garages are located at the very rear of the property at the end of a long, straight driveway or, less often, they are connected to the side or rear of the house. Typically the garages have a parapet front and feature details to match the house. (on sloped sites), parallel strip driveways, crazy paving, concrete paths, and large expanses of lawn. Three mature Bhutan Cypress (Cupressus torulosa) remain in the garden at 1489 Burke Road. This species was commonly used in interwar gardens as hedges on larger house blocks. A large multi-trunked Camphor Laurel (Cinnamomum camphora) at 61 Munro Street, planted as a specimen tree in the front lawn, makes a positive contribution to the Munro Street streetscape. Camphor Laurel trees were a popular large garden tree in interwar gardens. Integrity Some changes have occurred throughout the precinct, including demolition of some properties which have been replaced with modern houses of various styles and multi-residential developments. Other properties have been extended upwards or have had other alterations. A firstfloor extension was added to 53 Munro Street in 2000. Carports have been added to some front gardens (for example at 11 and 51 Munro, 3 Walbundry, 2 and 6 Cascade, 6 and 8 Kyora, and 1511 Old Burke Road). In spite of these changes, the integrity of the precinct is high, due in large part to the overall intactness of a high proportion of properties as viewed from the street. Many houses retain original architectural detailing of generally high quality. A number of properties retain original and early front fences, gates, garages, plantings and other garden elements. Comparatively, this is unusual for large residential precincts in Kew and Kew East. In most cases a handful of individual properties within a precinct might display this kind of comprehensive intactness of the site as a whole, such as at Goldthorns Estate Precinct, Kew (recommended for the HO).